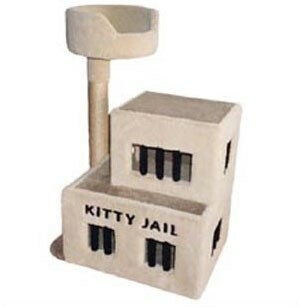 At 3-1/2' tall and just over 2-1/2' wide, this funny condo has carpeted "jail bars" in its 5 windows. It features an optional sisal rope scratch post with a cozy bed at the top and an inlaid title on the front of the first level. On the scratch post side, there are kitty doorways for each of the 2 levels. If your your cats are larger than average, try our NEW Jumbo Kitty Jails. They're 20% larger in length, width, and height. The jumbo sizes also have much larger doorways, 18-inch diameter beds, and 15-inch high ceilings on all enclosures. Perfect for your jumbo-sized kitties! Jumbo size also available in our deluxe 3-story model. Simple assembly required.